The purpose of this study was to evaluate the energy, macronutrient an selected micronutrient intake of second league Rugby Union players and to assess the anthropometric characteristic of this group. Players (n = 44) were divided into forwards (n = 20) and backs (n = 24), who differed significantly in weight (92.6 vs 80.8 kg), BMI (28.6 vs 24.5 kg/m2) and percentage of body fat (22.0 vs 13.3%). The dietary intake was assessed using 3-day dietary recalls. There were no significant differences in dietary intake related to player position. Athletes reported a mean daily energy intake of 3613.4 ±942.6 kcal (carbohydrates 41.4%, protein 17.8%, fats 39.3%). The mean intake of carbohydrates and protein were on a level of 4.8 and 1.9 g/kg of body weight/day, respectively. Although the mean daily intake of minerals and vitamins met recommendations, some players did not reach the requirements, especially for potassium (61.4%) and vitamin C (22.7%). The differences in body compositions of the players suggest differences in the type of training and the specificity of the player’s position. These improper proportions of dietary nutrients within the study group may decrease opportunities to achieve optimum results during matches. 1. Bean A. Żywienie w sporcie. Kompletny przewodnik. Zysk i S-ka Wydawnictwo. Poznań 2008. 2. Biesalski H.K., Grimm P. Żywienie. Atlas i podręcznik. Elsevier Urban & Partner. Wrocław 2012. 3. Burke L.M., Cox G.R., Cummings N.K., Desbrow B. Guidelines for daily carbohydrate intake: do athletes achieve them? Sports Med. 2001; 31 (4): 267–299. 4. Celejowa I. Żywienie w sporcie. Wydawnictwo Lekarskie PZWL. Warszawa 2008. 5. Collins T. A Social History of English Rugby Union. Routledge. Oxon 2009. 6. Collins T. Rugby’s great split: class, culture and the origins of rugby league football. Routledge. Oxon 2006. 7. Czeczelewski J., Długołęcka B., Czeczelewska E., Raczyńska B. Intakes of selected nutrients, bone mineralization and density of adolescent female swimmers over a three-year period. Biol Sport. 2013; 30: 17–20. 8. Charzewska J., Rychlik E., Wolnicka K. Żywienie osób o zwiększonej aktywności fizycznej. In: Praktyczny podręcznik dietetyki. Ed. M. Jarosz. Instytut Żywności i Żywienia. Warszawa 2010: 103–109. 9. Duthie G., Pyne D., Hooper S. Applied physiology and game analysis of Rugby Union. Sports Med. 2003; 33 (13): 973–991. 10. Eberle S.G. Endurance Sports Nutrition. Eating plans for optimal training, racing and recovery. Human Kinetics. Champaign 2000. 11. Finaud J., Lac G., Filaire E. Oxidative stress: relationship with exercise and training. Sports Med. 2006; 36 (4): 327–358. 12. Gabbett T.J. A comparison of physiological and anthropometric characteristics among playing positions in junior rugby league players. Br J Sports Med. 2005; 39 (9): 675–680. 13. Gabbett T.J., Ryan P. Tackling technique, injury risk, and playing performance in high-performance collision sport athletes. Int J Sports Sci Coach. 2009; 4 (4): 521–533. 14. Jarosz M. (ed) Normy żywienia dla populacji polskiej – nowelizacja. IŻŻ. Warszawa 2012, http://mail.izz.waw.pl/~it/NORMY/ NormyZywieniaNowelizacjaIZZ2012.pdf. 15. Jones J.R. Encyclopedia of Rugby Union Football. Robert Hale. London 1976. 16. Klich S. Fatigue development mechanisms during increased intensity exertion. 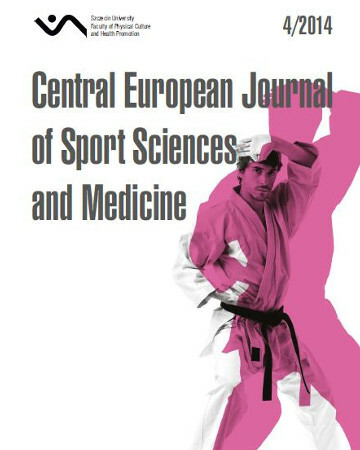 Centr Eur J Sport Sci Med. 2013; 1 (1): 39–45. 18. Kunachowicz H., Czarnowska-Misztal E., Turlejska H. Zasady żywienia człowieka. WSiP-n. Warszawa 2007. 19. Kunachowicz H., Nadolna I., Przygoda B., Iwanow K. Tabele składu i wartości odżywczej żywności. Wyd. 3. IŻŻ, Warszawa 2005. 20. Lundy B., O’Connor H., Pelly F., Caterson L. Anthropometric characteristics and competition dietary intakes of professional rugby league players. Int J Sport Nutr Exerc Metabolism. 2006; 16 (2): 199–213. 21. Manroe M.M., Barr S.I., Butterfield GE. Position of American Dietetic Assocition, Dietitians of Canada, and the American Colege of Sport Medicine, Nutrition and athletic performance. J Am Diet Assoc. 2000; 100 (12): 1543–1556. 22. Nicholas C.W. Anthropometric and physiological characteristics of rugby union football players. Sports Med. 1997; 23 (6): 375–396. 23. Pawlak M. Aspects of pain in sport. TSS 2013; 3 (20): 123–134. 24. Reilly T. The physiology of rugby union football. Biol Sport. 1997; 14 (2): 83–101. 25. Ryan H.F.G. The Development of Rugby in the River Plate Region: Irish Influences. Irish Migration Studies in Latin America. 2008; 6 (1): 29–37. 26. Sadowska-Krępa E., Kłapcińska B. Witaminy antyoksydacyjne w żywieniu sportowców. Med Sport. 2005; 21 (3): 174–182. 27. Sommerville D. The Encyclopedia of Rugby Union. Aurum Press Ltd. London 1997. 28. Szukała D. Odnowa żywieniowa po treningu. Med Sport. 2000; 9: 38–40. 29. Tarnopolsky M.A. Nutritional consideration in the aging athlete. Clin J Sport Med. 2008; 18 (6): 351–538. 30. Watson T.A., MacDonald-Wicks L.K., Garg M.L. Oxidative stress and antioxidants in athletes undertaking regular exercise training. Int J Sport Nutr Exerc Metab. 2005; 15 (2): 131–146. 31. Ziemlański Ś. Normy żywienia człowieka – fizjologiczne podstawy. Wydawnictwo Lekarskie PZWL. Warszawa 2001.